Darley has a potential successor to the formidable throne of the great Medaglia d’Oro in his young son Astern (Aus), a speedy Group 1 winner who is standing his second season at Jonabell in 2019. With high hopes that this well-pedigreed sprinter will make his mark on American soil, Darley America Sales Manager Darren Fox sat down with the TDN to discuss his prospects. 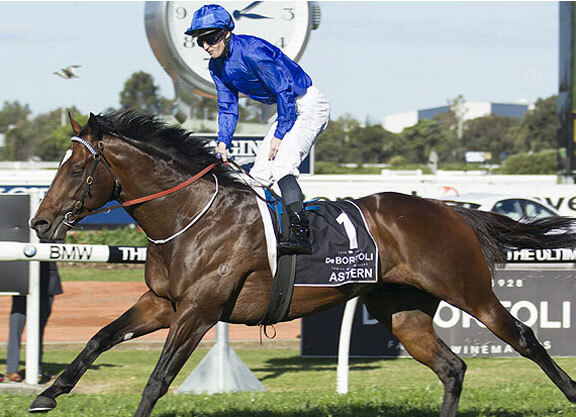 TDN: Can you start by telling us what your thoughts are and what you’ve been hearing from breeders on Astern’s first foals? DF: I’ve been hearing great reports on Astern’s first foals, and that’s certainly been backed up by our visits to our clients’ farms. To summarize, they just have a lot of quality which he has as an individual himself. I would say they’re freshly marked, strong foals-they have great hips and just have a lot of presence and quality. One filly in particular that comes to mind who went to one of our clients who is a leading owner and breeder. They had an Astern filly out of a Grade III-winning Giant’s Causeway mare and she was everything I just described. All the size, all the leg you would want, immense strength through her shoulder, great hip–just an attractive filly. But, the cherry on top was getting to watch her move in the paddock. She was so light on her feet, and just watching her move to her gait, she just floated. She was so light on her feet. TDN: Can you tell us about his first two books? How many mares did he cover last year? DF: In his first year we had a limit of 120 mares, which he was booked full in his first season. You know we are very excited about him being a speedy, precocious son of Medaglia d’Oro, who we can then cross over with two-turn American dirt mares. That’s something that we’re particularly excited about. Obviously, with Medaglia d’Oro we have a really extensive body of work upon which to judge what broodmare sire lines work best with him and his sons…His book is comprised of a high percentage of impact mating. So, we’re very excited that there was no guesswork, and we really could funnel high impact mares to him. Hopefully that will bear out in his first crop. TDN: In that same light, how important is it for you guys to have a potential heir to Medaglia d’Oro on the roster? DF: Hugely. I cannot understate how important it is. Obviously he is the linchpin of our stallion operation, but he is 20 years old. So, to find his heir and successor is something we are very focused on. Obviously Astern with his looks, female family, and race record-he was a natural face to slot in, and hopefully assume that mantle and carry on the line for us. TDN: Of all his accomplishments on the racetrack, is there anything in particular that stands out to you? DF: He was a very fast and precocious horse. That really sums him up. He won the G2 Silver Slipper, which is a prep for the G1 Golden Slipper, which is obviously the biggest race in Australia, and the richest 2-year-old race in the world. So, it’s a hugely important commercial race for the Australian industry. But, his big win came as a 3-year-old in the seven-furlong G1 Golden Rose. So, it’s the equivalent of our GI H. Allen Jerkens S. He won that in authoritative fashion, and just stamped himself as one of the best sprinters in the country. 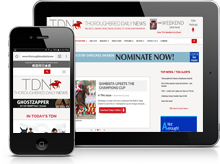 TDN: Can you describe the physical attributes that stamp him as a potential standout stallion? DF: His jockey declared that he has never ridden a horse that moved like Astern. Let’s not forget this is the high-class jockey, James McDonald, who at 27 years young has 35 Group 1 wins to his credit. So, he’s certainly a high-class jockey who knows what he’s talking about. But, to hear him talk about Astern’s movement, and when you watch his action, such an efficient, fluid, beautiful action. When you watch him at the end of his races, particularly the [2016 G1] Golden Rose, when he was fully extended, he almost has a moment of suspension in between each stride. That just indicates his athleticism and his incredible balance, which I feel are characteristics which will hopefully transfer to the US dirt racing or dirt surface, and hopefully allow him to be effective on both surfaces like his sire.